SPRINGFIELD, Mass. (November 16, 2015) — Smith & Wesson Corp. today announced that it is offering a chance for two lucky contestants to win a new Performance Center Ported M&P Shield. Beginning November 16th and continuing until December 20, 2015, Smith & Wesson will randomly select two qualifying participants, and award each with a new top-of-the-line pistol free of charge. Registration for the contest can be completed through the Smith & Wesson Facebook page. SPRINGFIELD, Mass. 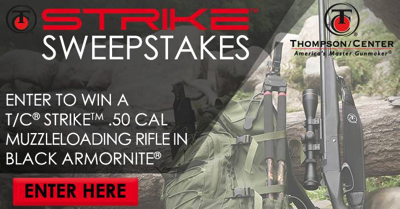 (November 16, 2015) — Thompson/Center Arms today announced that it is offering a chance for three lucky contestants to win a new T/C Strike muzzleloader through the company’s gun giveaway sweepstakes. Beginning November 16th and continuing until December 7, 2015, Thompson/Center Arms will randomly select one qualifying participant per week, and award each with a new muzzleloader free of charge. Registration for the contest can be completed through the Thompson/Center Arms Facebook page.